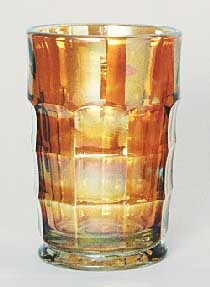 A rarely found marigold tumbler and one of the few made in Mexico. According to the late John Britt, the manufacturer was located in Monterrey, Mexico. They are marked on the bottom with a "C" over an "M." Two sold in 2011 for $15 and $40 and one in 2013 for $50.